The AmaViola is part of the Concerto class of river ships cruising the rivers of Europe. 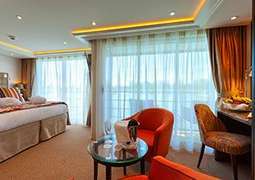 The luxurious design and spacious areas are the perfect places to enjoy a cruise a make new memories. 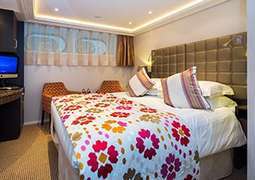 All of the Cabins on board the AmaViola are full of amenities which are sure to make you feel as comfortable as possible while on board. A neat and luxurious design is coupled with extras like double balconies in some cabins to make a space which is ideal to call home while you cruise. The spacious Cabins feature high-quality bedding and technical features including a computer monitor that doubles as a television and European and American power outlets meaning you are not left wanting anything in your home away from home. All aspects of dining are covered on the AmaViola, from breakfast and light snacks to four-course dinners and late-night snacks. The main restaurant serves up food and drinks which are traditional to the places you visit on your cruise, so the cruising experience is fully immersive. There are also more universal options apart from the regional specialities to ensure that all passengers are catered to. The Chef's Table Restaurant offers some of the finest dining on the European waterways, blending fresh local ingredients, your chef's supreme skills and an accompaniment with local wines selected by the sommelier. With a cruise on the AmaViola being such a cultural experience, your cruise includes shore excursions meaning you can see the very best of the locations you cruise to. As well as these excursions there are musical performances, interesting presentations and a range of other performers. The heated pool on the sun deck is the perfect place to enjoy a relaxing swim while the swim up bar is the ideal way to enjoy a cool drink while enjoying the beautiful scenery. A massage and beauty salon is also on board if you feel like being pampered.